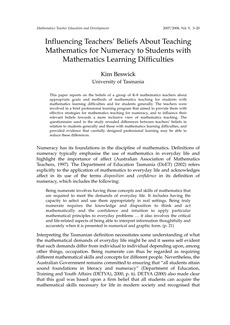 This paper reports on the beliefs of a group of K-8 mathematics teachers about appropriate goals and methods of mathematics teaching for students with mathematics learning difficulties and for students generally. The teachers were involved in a brief professional learning program that aimed to provide them with effective strategies for mathematics teaching for numeracy, and to influence their relevant beliefs towards a more inclusive view of mathematics teaching. The questionnaire used in the study revealed differences between teachers’ beliefs in relation to students generally and those with mathematics learning difficulties, and provided evidence that carefully designed professional learning may be able to reduce these differences.